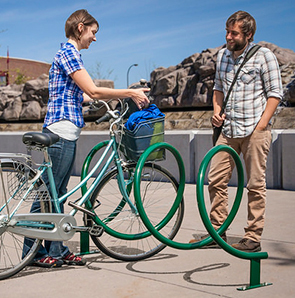 Remarkable, space efficient and expandable, the Helix Bike Rack adds an instant touch of eccentric landscape art while also providing a solution for dependable bike parking. 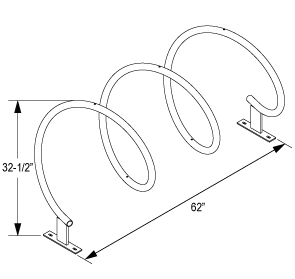 Helix Bike Rack features a twisting design that allows two—way bike entry, U-Lock compatible and two points of contact for stability and peace of mind. The unique winding, spiral Helix allows six bicycles to be lined up and be properly secured. Constructed with 1.66"O.D. rounded steel pipe and protected with a choice of non-corrosive finishes, the Helix is capable of maintaining it's original look throughout many years of use.